The Astro Pi is a Raspberry Pi computer with a special add-on board full of sensors, a camera and LED display. It's perfect for space science and learning about programming. What makes the Astro Pi so special is the Hardware Attached on Top board, called HAT for short. This board, as the name suggests, is attached on top of the Raspberry Pi computer via the 40 General Purpose Input Output (GPIO) pins which provide the data and power interface. This board has several integrated-circuit based sensors that can be used for many different types of experiments, applications, and even games. Gyroscope - A gyroscope measures the orientation of an object. Accelerometer - An accelerometer measures the speed of movement of an object. Magnetometer - A magnetometer is used to measure the strength and direction of a magnetic field. Temperature sensor - A temperature sensor is used to measure hot and cold. Barometric Pressure sensor - A pressure sensor (sometimes called a Barometer) measures the force exerted by tiny molecules of the air we breathe. Humidity sensor - A humidity sensor measures the amount of water vapour in the air. 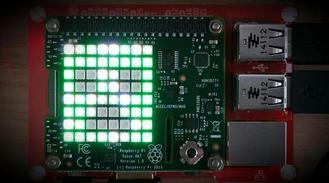 8×8 RGB LED Matrix Display - This is the only real form of visual output that the Astro Pi computers will have up on the ISS. 5 button joystick - This is a standard direction pad, like the one on your console control pad, made up of five buttons for up, down, left, right and centre. Astro Pi forum - Forum to discuss, ask questions, get advice, and to share ideas about how to use the Astro Pi! Astro Pi Code reference sheet - Dan Aldred (@Dan_Aldred) has created a guide to programming the sensors on the astro pi. Astro Pi Guide - Official guide to the Astro Pi courtesy of the Raspberry Pi Foundation. Astro Pi Python Cheat sheet - Astro Pi Python 3 cheetsheet courtesy of the Raspberry Pi Foundation. pythonhosted.org/astro-pi/ - Guide to using the Astro Pi with example code.